License plates are issues by the Registry of Motor Vehicles in Massachusetts. New residents must register their out-of-state vehicles within 30 days of their arrival. There are various speciality license plates to choose which can also be personalized. You are required to register your vehicles in the state of Masaachusetts Registry of Motor Vehicles (RMV). The license plates you receive must be attached to the rear and front of your vehicle (exceptions: motorcycles and trailers). You must also attach validation stickers which display when the license plates expire. For people with disabilities, it is possible to obtain special license plates and placards which permit them to park in designated spots. There are also specialty plates which represent various organizations, charities, and groups in Massachusetts. 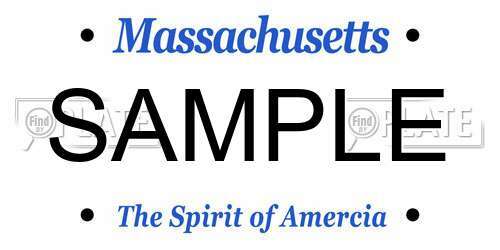 Additionally, the standard plate issues by the RMV is the white background with red lettering plate (includes the slogan, “The Spirit of America”). All license plates in Massachisetts can be personalized. See the “Summary of Fees for License Plates in Massachusetts” to get a general idea for the cost of some of the above specialty license plates. You can create a custom plate number for your license palte for just $80 ($50 to order the plate and $30 to register it). Here’s an example of a plate you can have: “ZZ9876” or “AB1234”; and, you cannot have: “AA19BB” or “123ABC”. If you’re a new resident, you must register your out-of-state vehicle within 30 days. If you recent purchased a new vehicle, registering your vehicle will vary due to how the vehicle was acquired (i.e. gifted vs. purcahsed) and which county it came from. If you’re vehicle was gifted, you may be exempted from paying sales tax. Also, when purchasing your vehicle from a dealership, some dealers will handle the registration of your vehicle. Your license plates have decals attached to the rear license plate. The dates associated with these stickers relate to the expiration of your registration. You may receive a reminder in the mail, however payment for renewal must be made in advance of the plates expire to avoid late fees. You’ll receive a new sticker after your payment is process. You can place these over the old stickers on your license plate. It will cost you $25 to transfer your plates along with any other registration fees required for your vehicle. You can use the RMV’s online services to cancel your plates. Afterward, you can surender your plates by mailing them or bringing them to the nearest RMV office in Massachusetts. Alternatively, you can destroy and recycle your own plates should you know longer need them. You should still cancel your plates online if you choose to do this. Registering your vehicle may also require payment of taxes, titling fees, service fees, and additional fees. Contact your local RMV for more details. If you want to see the history of a used vehicle before purchasing, it is possible to look up license plates in Massachusetts. All you need to look up license plates is the plate number and the state name. You can also use this license plate search tool to find available plate numbers for personalization.